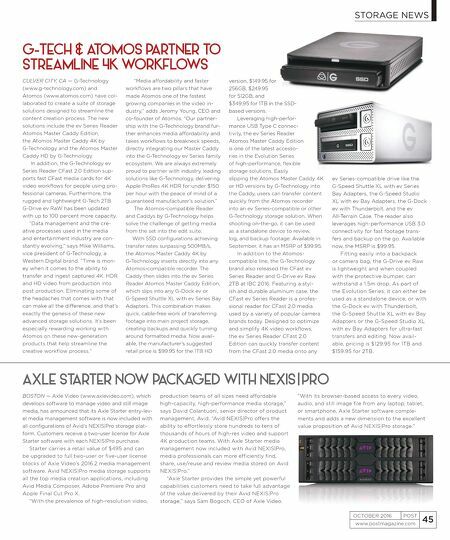 STORAGE NEWS www.postmagazine.com 44 POST OCTOBER 2016 LAIKA ADDS AVID'S NEXIS HILLSBORO, OR — Animation studio Laika (www.laika.com), known for its Oscar-nominated feature films Coraline, ParaNorman and The Boxtrolls, and for its latest film, Kubo and the Two Strings (pictured), re- cently invested in Avid's software-de- fined NEXIS storage platform. Lead media engineer Trevor Cable, at Laika, opted for Avid NEXIS | E4 high-density storage, citing its media management capabilities, as well as its cost and past experience using Avid products. "One of the other reasons I wanted to move back to Avid is the management software — the NEXIS management software is incredi- bly intuitive and easy to operate," explains Cable. "And the cost is now very competitive. With the great user management that Avid provides and the cost, it was a no-brainer." According to Cable, installation of the Avid NEXIS system was quick and straightforward. He had the system up and running for a couple of weeks before switching over to ensure it was running properly. After two weeks without any problems, Cable decided they were ready. "It was incredibly easy," he notes. "All I had to do was copy all the files and that was it. It came to us con- figured and ready to go. Over the course of an evening, I got all the edit systems switched over, and the next morning people came in and we were on the new system. It was a very seamless, easy switchover." Laika started using NEXIS in its production pipeline back in August. While NEXIS works with all the top media creation applications, Laika uses Avid Media Composer. The studio currently has nine edit workstations and Cable anticipates that they'll have 16 editors working a year from now. "It's been absolutely flawless," he says of the solution. "I don't have to worry about it — it basically takes care of itself. I feel very comfortable that it's going to remain up and running, and if I do have any techni- cal problems, they will be dealt with immediately." DDN PROMOTES ROBERT TRIENDL SANTA CLARA, CA — DataDirect Networks has promoted Robert Triendl to senior vice president of global sales, marketing and field services. Triendl will leverage his more than eight years of experience leading DDN's Asia Pacific, European and Japanese markets to now focus on accelerating the worldwide adoption of the company's end-to-end storage solutions. "Having successfully built and led teams across various parts of the world, including Europe, Asia Pacific and Japan, Robert is a demonstrated stra- tegic leader with deep technical know-how, an un- compromising focus on customer satisfaction, and a keen ability to anticipate market changes," says Alex Bouzari, CEO and co-founder, DDN. "Organizations are increasingly looking for end-to-end, cloud and open source enabled solutions to their realtime business intelligence and data management chal- lenges. These new trends, while disruptive to many companies, are creating significant opportunities for DDN, and Robert will accelerate our growth in the scalable, high performance data markets where DDN has been a leader for more than a decade." Triendl will be responsible for DDN's global sales, marketing, product marketing & product manage- ment, field services and support functions. 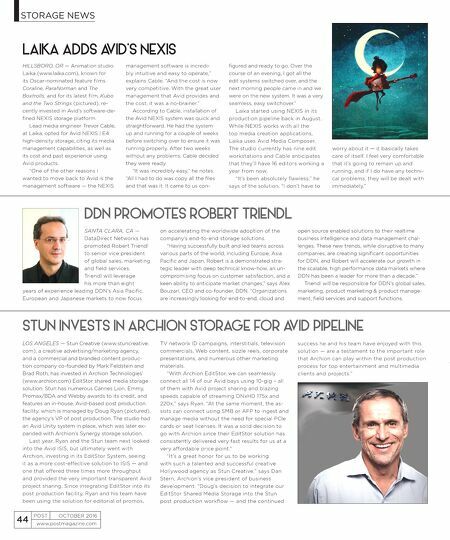 STUN INVESTS IN ARCHION STORAGE FOR AVID PIPELINE LOS ANGELES — Stun Creative (www.stuncreative. com), a creative advertising/marketing agency, and a commercial and branded content produc- tion company co-founded by Mark Feldstein and Brad Roth, has invested in Archion Technologies' (www.archion.com) EditStor shared media storage solution. Stun has numerous Cannes Lion, Emmy, Promax/BDA and Webby awards to its credit, and features an in-house, Avid-based post production facility, which is managed by Doug Ryan (pictured), the agency's VP of post production. The studio had an Avid Unity system in place, which was later ex- panded with Archion's Synergy storage solution. Last year, Ryan and the Stun team next looked into the Avid ISIS, but ultimately went with Archion, investing in its EditStor System, seeing it as a more cost-effective solution to ISIS — and one that offered three times more throughput and provided the very important transparent Avid project sharing. Since integrating EditStor into its post production facility, Ryan and his team have been using the solution for editorial of promos, TV network ID campaigns, interstitials, television commercials, Web content, sizzle reels, corporate presentations, and numerous other marketing materials. "With Archion EditStor, we can seamlessly connect all 14 of our Avid bays using 10-gig – all of them with Avid project sharing and blazing speeds capable of streaming DNxHD 175x and 220x," says Ryan. "At the same moment, the as- sists can connect using SMB or AFP to ingest and manage media without the need for special PCle cards or seat licenses. It was a solid decision to go with Archion since their EditStor solution has consistently delivered very fast results for us at a very affordable price point." "It's a great honor for us to be working with such a talented and successful creative Hollywood agency as Stun Creative," says Dan Stern, Archion's vice president of business development. "Doug's decision to integrate our EditStor Shared Media Storage into the Stun post production workflow — and the continued success he and his team have enjoyed with this solution — are a testament to the important role that Archion can play within the post production process for top entertainment and multimedia clients and projects."